CHARLESTON, W.VA. (09/19/18) – The West Virginia Symphony Orchestra (WVSO), kicks off the City National Bank Casual Classics series with two concerts on Oct. 13 in Charleston at 2:00 p.m. and 7:30 p.m. Guest artist, Bradley Welch joins the WVSO and Music Director Lawrence Loh for a weekend full of music focused around the hauntingly beautiful instrument, the organ. “The intimate setting of our Casual Classics concerts will put the spotlight on our musicians, and Beethoven’s 1st Symphony is the perfect kind of piece for this special concert setting,” said Loh. “I’m also excited to welcome Bradley Welch, a brilliant organist, who will be spectacular in the Poulenc Concerto!" The City National Bank Casual Classics series is in its inaugural season and blossomed out of support for a chamber music-like series in conjunction with the Symphony’s year-long schedule. This came after a very successful performance at First Presbyterian Church in Charleston last season. Tickets for the two concerts at First Presbyterian Church in Charleston on Oct. 13, start at $20. Tickets are available at wvsymphony.org or by calling 304.561.3570. This City National Bank Casual Classics series concert is made possible by the generous support of the McGee Foundation, and is presented in loving memory of John & Ruth McGee. CHARLESTON, W.VA. (4/16/18) – The West Virginia Symphony Orchestra (WVSO) unveiled its new 2018-2019 season that includes an all-American performance featuring country music legend Lee Greenwood, Bugs Bunny and friends set to live music, and a new City National Bank Casual Classics Series that takes orchestral music inside two stunningly beautiful Charleston churches. Series subscription sales, which range from $96 to $495, begin this week. Single ticket sales start Aug. 1. The Elliot Foundation Symphonic Series kicks off Sept. 29 at the Clay Center. The WVSO’s Opening Night Spectacular features guest pianist Jon Nakamatsu playing Tchaikovsky’s Piano Concerto No. 1, and includes WVSO performances of Torke’s Javelin and Rachmaninoff’s Symphonic Dances. The WVSO’s fourth symphonic concert, NINE!, brings the voices of area choruses together with the WVSO to perform Beethoven’s Symphony No. 9, along with guest cellist and Astral Artist Gabriel Cabezas, who will play Camille Saint-Saëns’ Cello Concerto No. 1 with the orchestra. During this March 23 concert at the Clay Center, the WVSO will premiere a special arrangement by American composer Gary Fry being written especially for the WVSO and the Appalachian Children’s Chorus. Twin pianists Christina and Michelle Naughton will dazzle Clay Center audiences with a May 4 performance of Mozart’s Double Piano Concerto in E-flat Major. Rounding out the WVSO’s final symphonic concert of the season, Double Treble, are performances of Shostakovich’s Festive Overture in a side-by-side performance with the West Virginia Youth Symphony, and Shostakovich’s Symphony No. 10. New this year is the WVSO’s City National Bank Casual Classics Series, which builds on the success of last year’s Go For Baroque concert at First Presbyterian Church in Charleston in which the WVSO featured the church’s exquisite organs. Once again, the WVSO will perform music perfectly suited to the venue on October 13 as guest organist Bradley Welch performs Poulenc’s Organ Concerto. Performances of Schubert’s Rosamunde Overture and Beethoven’s Symphony No. 1 will complete the WVSO’s Pipe Dreams concert. The ZMM Architects & Engineers Pops Series kicks off Oct. 20 with Lee Greenwood: Salute to America, a special SuperPops concert at the newly renovated Charleston Civic Center. This special concert features some of Greenwood’s most famous songs, including God Bless the USA, and offers special VIP seating and hospitality tables on the arena floor. Guest conductor Michelle Merrill will return to the Clay Center on Dec. 8 for the WVSO’s celebrated holiday tradition, newly renamed Sounds of the Season, which will offer a selection of fun, holiday favorites, and, of course, a visit by Jolly Old Saint Nick. On Feb. 9, guest soloist Tony DeSare will join the WVSO at the Clay Center in performing some of Frank Sinatra’s most beloved tunes. In this critically-acclaimed tribute to Ol’ Blue Eyes, the WVSO will deliver a fresh take on old-school classics like Fly Me to the Moon, The Summer Wind, and My Way. The ZMM Pops Series concludes April 13 with a celebration of some of the most beloved cartoons in the world and equally famous classical music with Bugs Bunny at The Symphony II. The WVSO will play live music as the hilarious antics of Daffy Duck, Road Runner and Tom and Jerry, just to name a few, play out on the screen overhead. 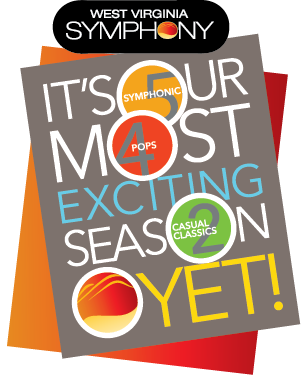 To order your subscription, call the Clay Center box office at 304.561.3570 or visit wvsymphony.org.